The 3D scanner market is projected over USD 7.4 billion by 2024. It should experience a decent 11.5 % CAGR during the forecast period (2016 to 2024). The global 3D Scanner Market is expected to reach USD 7.4 billion by 2024. It should grow at a CAGR over 11.5 % during 2016 to 2024 (forecast period). Wider adoption of these devices in applications; such as rapid prototyping, quality control, reverse engineering, etc. will augment growth of this industry. Software & hardware providers lay stress on workflow enhancement & usage convenience, thus boding well for the market and propelling its sales. The workflow is generally complicated for those new to 3D scanning. This coupled with costly scanners hampers the growth of 3D scanners. However, the demand for accurate, quick, & effective results primarily would drive the 3D scanner market. In addition to this, scanner properties; like affordability can also propel the market. ‘Handheld 3D scanner’ & technological expansion are projected to drive the industry demand in the near future. The market is categorized into products, ranges, applications, and regions. Products include structured light, laser, and optical. Laser scanners led the market in 2013. However, optical and structured light are anticipated to grow rapidly. Optical scanners should grow at a healthy CAGR (over 11 %) during the forecast period. Ranges consist of short, medium, and long. Short range scanners dominated in 2013. They will maintain their dominance till 2024. Medium is likely to gain considerable shares, at a CAGR of 11 % till 2024. Long range is said to be growing slowly due to its high costs. 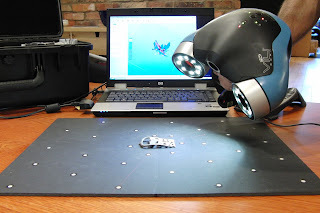 Applications in the 3D scanner market are aerospace & defense, industrial manufacturing, healthcare, entertainment & media, and engineering & architecture. Industrial manufacturing reigned in 2014, accounting for 30 % shares. 3D scanning can be a critical component of quality & inspection control across construction industry. Entertainment & media should witness the highest growth. It is estimated to reach USD 600 million by 2024, at a healthy CAGR of 13 %. Rising significance of market devices in architecture may be attributed to the advent of portable 3D scanners. 3D scanners help in archiving and preserving architectural pieces from museums. Engineering & architecture will hold over 12.5 % shares by 2024. Geographically, the worldwide 3D scanner market is fragmented on the basis of Europe, North America, Latin America, Asia-Pacific, and RoW. North America reigned in 2013 and can lead over the forecast period. Latin America is said to be the most lucrative region. It is predicted to exceed USD 750 million by 2024, at a CAGR of 13 % in the near future. The same would be attributed to rising adoption of 3D scanners across various application and end-user industries. Asia-Pacific held over 23% shares in 2014. This region is expected to grow rapidly, surpassing incomes worth USD 1.5 billion by 2024. Major companies in the global market comprise Basis Software Inc. (Surphaser); 3D Digital Corp.; Topcon Corp.; and FARO Technologies. The industry is marked by strong rivalry and often indulges in mergers & acquisitions. Firms cater to different sectors; like manufacturing, aerospace, education & research, and consumer goods. Introduction of ‘quality’ & ‘affordable’ 3D scanners provide future market prospects.